Beat the heat of a New Mexico summer with air conditioning and cooling equipment that truly suits your needs! At B. Carlson Heating, Air Conditioning & Plumbing, our experienced and certified HVAC contractors will assess your home’s needs to provide optimal refrigerated air conditioning services. Are you done with your swamp cooler? If you’re looking to switch to refrigerated air, you’ve come to the right place! 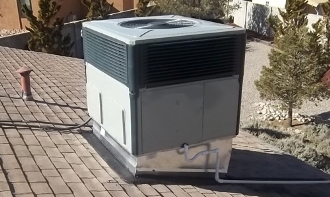 B. Carlson Heating, Air Conditioning & Plumbing has been offering leading air conditioning services to Albuquerque homeowners for years. Breathe easier with us! Ask us about our refrigerated air conversion process! Contact B. Carlson Heating, Air Conditioning & Plumbing online or request a quote today! Refrigerated air, also known as central air conditioning, is one of the most effective ways to cool a home—which is why it’s a popular choice for Albuquerque homeowners like you! With refrigerated air, you just simply set your thermostat at a comfortable temperature and that’s it! You can switch from heating to cooling automatically without switching dampers like a swamp cooler. People always ask us about the cost of refrigerated air. New refrigerated air systems offer efficiencies that compare very closely to your evaporative cooling system, and without the water usage! Want to learn more about refrigerated air? Give our experienced HVAC contractors a call at (505) 225-3016. If you’re ready for a cooling system that boasts superior power, increased effectiveness, and overall far more “oomph,” then a refrigerated air conditioning conversion is your best bet! Our air conditioning specialists will help you evaluate your specific and unique needs, then match you with the ideal cooling system to ensure optimal efficiency and comfort for your Albuquerque home. At B. Carlson, our AC experts carry specialized training in refrigerated air conditioning conversion and installation services, so you can rest assured that the job will be precise and flawless, bringing you the cooling power and relief you need to beat back the harsh summer heat. We offer leading central cooling system products to our clients, so you know that not only will the service be perfect—the products will match! Thinking of converting to refrigerated air in Albuquerque? Get a free system quote now! Comfort control – Refrigerated air conditioners provide cool air flow directly from the source into every room of a house, not into just one or a few rooms, as do unit air conditioners. Cool air travels through the air ducts and vents to cool individual rooms and hallways. Quieter operation – On a refrigerated air conditioner, the condenser, fan, and compressor are located in an outdoor unit. Because of the layout of the central air conditioning system, indoor noise is barely detectable. Improved air quality – Refrigerated air systems don’t use water to cool homes, which limits the amount of humidity they create. Due to lack of humidity, they will not promote the ability for mold and allergens to grow, meaning your home will have cleaner air. Fewer repairs – Are you tired of scheduling frequent AC repair for an old or worn-out system? A new, high-quality refrigerated air unit could last for several years with routine maintenance. No more open windows – Even with a screen in place, an open window can be an invitation to bugs of all kinds—not to mention the potential home security risks. Many homeowners in Albuquerque choose to convert simply because they are tired of having to leave windows open all the time. Less water consumption – Evaporative cooling systems require specific amounts of water in order to operate. By converting, you can not only save yourself the cost but aid in water conservation! Learn more about the benefits of installing refrigerated air in your Albuquerque home! Call B. Carlson at (505) 225-3016! How Much Does It Cost to Convert to Refrigerated Air? If you’ve been thinking about converting from a swamp cooler to refrigerated air conditioning but are curious about how much it costs to convert to refrigerated air, you’ll be pleased to learn that converting to refrigerated air is much more affordable than you might’ve thought. Whenever converting a home from evaporative cooling to refrigerated air, it is essential to determine the proper size equipment for your particular home or building. The old adage “bigger is better” is not the case when it comes to your heating and cooling system! When your heating and cooling system is oversized, it will “short cycle,” meaning it will come on for short spurts then turn off. In addition to placing more wear and tear on your system, a system uses the most energy when it is starting. Additionally, oversized systems will have larger motors and compressors, which in turn draws more energy to operate. In addition to energy consumption, a system that is oversized will not maintain comfort as well as a properly sized system. Air conditioners need to run for longer periods of time to dehumidify properly. Systems that short cycle will also lead to uneven temperature swings in your living space. Properly sized systems will run for longer periods of time thereby circulating your air more evenly throughout your home, leading to better comfort! In order to select the proper sized equipment, B Carlson will perform a “load calculation” using industry standards for our climate that takes into account the unique characteristics of your home or building. We measure walls, ceilings, floors, windows and doors, and review construction specifications such as window types, insulation values, and even the orientation of your home as it relates to the sun. Every home or building is different, and one size does not fit all. Two story homes also have better results when there are two separate units to control the different levels due to the rising heat between floors. Other factors that could influence the cost of your refrigerated air conversion are your current electrical capabilities, and the quality of your ductwork. Some homes converting from a swamp cooler to refrigerated air will need special electrical upgrades or ductwork repair, impacting your bottom line. The first step to refrigerated air conversion is an in-depth home evaluation of all the above to truly understand what it takes to correctly and safely convert your home to refrigerated air conditioning. Schedule your free consultation and evaluation today! Contact us online or call (505) 225-3016 to make the switch to a refrigerated air conditioning system in the Albuquerque area! When you want the reliability and sheer power of a top-class central cooling system, you need to look no further than the specialists at B. Carlson! We’ve been Albuquerque’s leading HVAC service team for a long time, and no one else can offer you the reliability and superior service of a B. Carlson specialist. B. Carlson provides refrigerated air services in Albuquerque and around Bernalillo, Corrales, Los Lunas, North Valley, Placitas, Rio Rancho, Sandia Heights, and South Valley. Contact our cooling experts today at (505) 225-3016 to learn more about our refrigerated air services in Albuquerque, New Mexico.